Carolyn Resnick and Nancy Zintsmaster offer a great opportunity for you to learn how to relate to your horse in an entirely new way! Ever wondered how to train a horse at liberty from the very beginning? Want to develop a deep bond and connection with your horse and strengthen the relationship you have with your horse? Want your horse to connect with you based on the bond that you have together, rather than the tack or the training? Turn your horse's NO into a YES! Learn to create a magical connection with horses through bonding rituals natural to horses. Learn to communicate in a language that is innate to the horse. All clinic work is on the ground, at Liberty (no riding or tack). Private 1-hour lessons (on the day after the clinic ends) Optional @ $125/hr. You are welcome to bring your own horse to this private lesson, even if your horse is not participating in the entire clinic. Registration for private lessons, available exclusively to clinic participants. Limit 7 participants. Every year thousands of healthy horses, including pregnant mares and their foals, are sent to slaughterhouses. The goal of Pregnant Mare Rescue is to save as many pregnant mares as they can from abuse, neglect and a trip to the slaughterhouses. Their intent is to gentle the mares and the foals and prepare them for new, loving homes. They simply cannot do this important lifesaving work without you! Each and every dollar donated goes towards rescuing and caring for the horses. 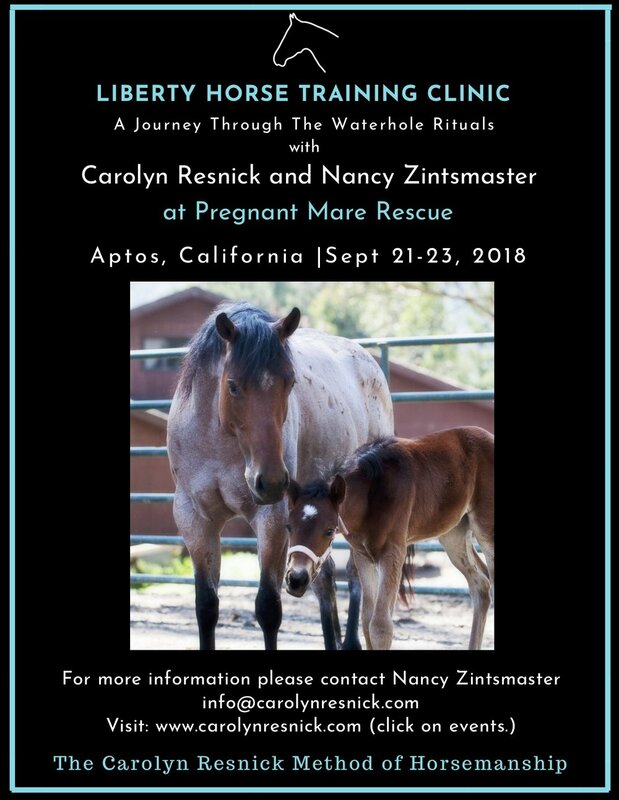 We at Carolyn Resnick Method of Horsemanship support this mission and hope that you will join Carolyn Resnick, Nancy Zintsmaster and the team at Pregnant Mare Rescue for an amazing journey through the Waterhole Rituals, a method of training horses at Liberty! The Itinerary is flexible. Changes may occur due to weather or unforeseen circumstances. This is a group clinic. if the clinic does not have sufficient attendance then we guarantee a 100% refund. We suggest that you purchase travel insurance to avoid any losses in case of cancellation.